We have now officially entered High Baking Season, and can balm ourselves in butter and sugar. We can surround ourselves with our favorite cookbooks, and tune out the crazy. That’s my new personal strategy, anyway. And just in time for its implementation, I received Sarah Kieffer’s new cookbook, The Vanilla Bean Baking Book. Which is perfect, because it’s packed with enough crave-worthy recipes to keep me avoiding American reality until February, at least. Excellent! I’ll be honest: I’ve received a lot of cookbooks this season, many gifted, some impulsively purchased. Most of them sit in a towering stack at the edge of my desk, giving me puppy-dog eyes and making me feel terrible for not having time to really dig into them. And then there’s a couple that are already littered with post-its from bookmarking, plus have a few splotches and stains from use, and aren’t those the kind of books we all need more of? And then there's The Vanilla Bean Baking Book. It comes correct with sweet inspiration, providing recipes that may not be screaming with one million Pinteresting colors and craziness, but instead offer what we actually need in real life: straight up delicious, comforting, often classic (but sometimes surprising) baked goods with dynamite flavors and textures. Sarah’s recipes are exactly the kind of thing I want at 3:00 p.m. when I’d sooner jump off the roof than skip a treat with my afternoon coffee. Everything from simple quickbreads to yeasted morning bakes to cookies and celebration cakes. All beautiful, relatively easy, and just special enough to make every recipe refreshingly different than the usual suspects, whether it be due to a neat technique or a few added ingredients. In short, this book represents the kind of baking we all need, right now. And it would make a slam-dunk gift if you're the cookbook-gifting type. Am I overreaching? I don’t care. 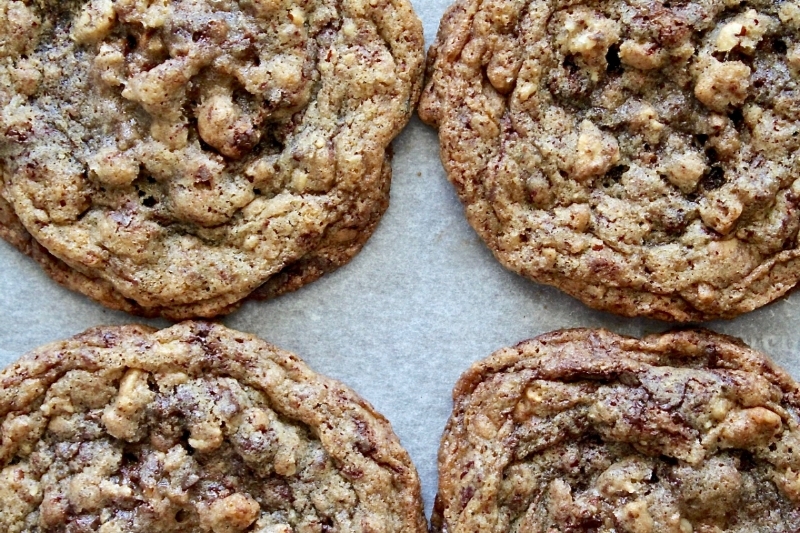 My mouth is full of Granola Chocolate Pecan Cookies and nothing else matters. These cookies are of the generous coffeehouse size, and are portioned with a standard ice cream scoop. Avoid the temptation to make them smaller in the name of portion control. Sarah makes a lot of her recipes with these large portions, and I think that’s the key to their sensational texture—crisp on the edges, wonderfully soft in the middle. There’s a great recipe for homemade granola in the book, and that’s what the original recipe calls for. But I had some of my favorite Praline Pecan granola from Trader Joe’s on hand, and used that instead. Terrific! Position oven racks to the upper and lower thirds of the oven and preheat it to 350 degrees F. Line two baking sheets with parchment paper. In a medium bowl, stir together the granola, flour, baking soda, and salt. In the bowl of an electric mixer fitted with the paddle attachment, beat together the butter and sugars on medium speed until smooth and lightened, about 3 minutes. Beat in the egg and vanilla. Reduce the speed to low and gradually stir in the dry ingredients, followed by the chocolate bits and pecans. Using a standard ice cream scoop with a capacity of 1/4 cup, portion the dough onto the baking sheets, 6 cookies to a sheet. Bake for 12-15 minutes, until the cookies are golden and set at the edges, but still quite soft at the centers. Let cool on the baking sheets for 5 minutes before transferring to a wire rack to cool completely. Store in an airtight container at room temperature for up to 5 days.